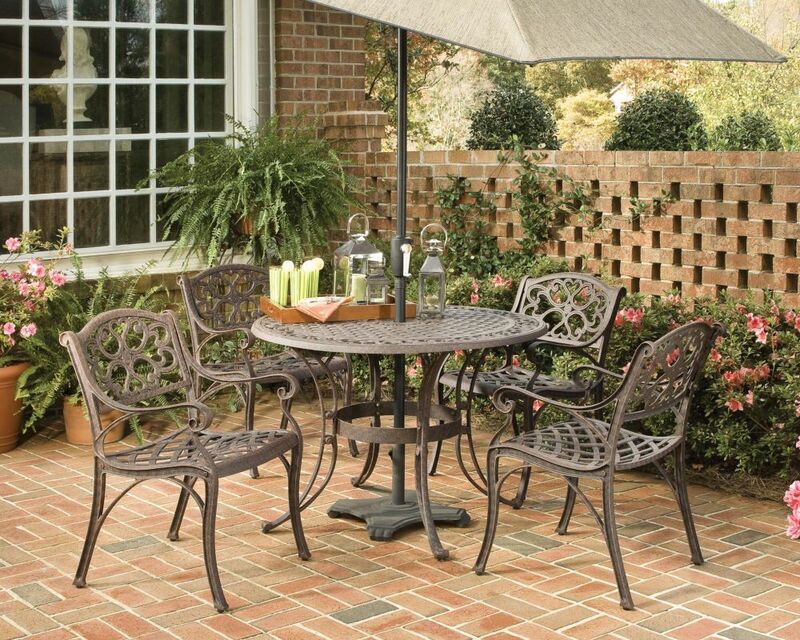 Home Styles Biscayne 5-Piece Set includes 42-inch Round Outdoor Dining Table and Four Arm Chairs. Set is constructed of cast aluminum with a bronze finish. Features include powder coat finish sealed with a clear coat to protect finish, attractively patterned table top has center opening to accommodate umbrellas, and nylon glides on all legs. The Cumberland Stone Outdoor Collection by Home Styles offers a sophisticated stone appearance with the added durability and strength of lightweight and maintenance free materials. The Cumberland Stone Outdoor Collection is guaranteed to compliment your outdoor space as the blue and gray hues are so versatile it lends itself to coordinating with any outdoor dicor. The table is constructed of solid stone veneer over a marine plywood core. The powder-coated metal base is accentuated in a neutral gray finish. Chair features include a gray synthetic-weave seat and back over a powder coated tube metal frame in a gray finish. The synthetic-weave is both moisture and weather resistant, and requires very little maintenance. Adjustable, nylon glides prevent damage to surfaces caused by movement and provide stability on uneven surfaces. Set includes table and four arm chairs. Assembly required. Table Size: 60w 40d 30h. Arm Chair Size: 24.5w 24d 36h. Biscayne 5-Piece Patio Dining Set with 42-inch Bronze Table and Four Arm Chairs Home Styles Biscayne 5-Piece Set includes 42-inch Round Outdoor Dining Table and Four Arm Chairs. Set is constructed of cast aluminum with a bronze finish. Features include powder coat finish sealed with a clear coat to protect finish, attractively patterned table top has center opening to accommodate umbrellas, and nylon glides on all legs. Biscayne 5-Piece Patio Dining Set with 42-inch Bronze Table and Four Arm Chairs is rated 1.0 out of 5 by 1. Rated 1 out of 5 by dschach from concerns The set is visually pretty, but very cheaply made. The chairs came without instructions, but after putting the table together, I figured it out. The finish is going to easily chip and it comes with all kinds of disclaimers...nothing hot, don't put it in the sun, etc. I would not buy this again and encourage others to look around before purchasing this.